Search for accommodation using the form below or for more options, use the Advanced Search facility. Main Beach, Gold Coast, is just 2 minutes north of Surfers Paradise and is considered to be a more wealthy beachside area. Main Beach is very popular with trendy dining areas situated along Tedder Avenue with its modern cafes and exclusive restaurants. Main Beach is the quintessential Gold Coast suburb. It’s the perfect example of the Gold Coast because of its mix of theme parks, dining and laidback beachside culture. Main Beach is home to Sea World and Palazzo Versace hotel, the natural, low developed beaches of The Spit and the Gold Coast famous dining precinct on Tedder Avenue. Main Beach is located near a long sandbar known as The Spit. The Spit divides the Broadwater from the Pacific Ocean. 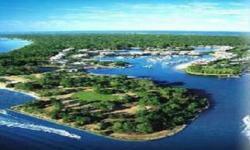 It is very popular with boaties, surfers and anyone who enjoys fishing. Main Beach is also reknown for trackside apartments for the Gold Coast Indy 300. Main Beach accommodation is at the very heart of the Gold Coast but in a space of its own and only minutes away from Surfers Paradise. South Stradbroke Island is one of Australia's rare and unique sand islands. Undeveloped, and with an unspoilt beauty, it boasts a vigorous diversity of flora and fauna. Only 45 minutes from Brisbane. The southern end of South Stradbroke fronts the Broadwater, and the tip marks the Gold Coast Seaway, only metres from the mainland at Southport Spit. In the northeast you'll find the Tipplers Passage that separates the island from many small islands near the mainland. Stay in award-winning South Stradbroke Island holiday accommodation ... perched over the water's edge, or in self-contained cabins nestled deep in a forest of Banksia trees. The Gold Coast Broadwater, also known as Southport Broadwater and Gold Coast Harbour. Gold Coast Broadwater is a large shallow, calm expanse of water reaching from the locality of Southport to the southern section of the World Heritage Listed Moreton Bay. 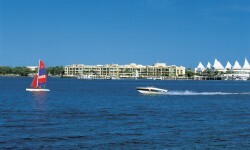 The Broadwaterway is a 19km foreshoreway along the shores of the Gold Coast Broadwater. The Broadwater water is suitable for swimming and boating and is only 6 minutes from Surfers Paradise, Gold Coast. The Broadwater area includes the towns of Southport, Biggera Waters, Hope Island and Runaway Bay which all run along the stretch of the shores of the Broadwater. The Gold Coast Broadwater includes The Spit, Sea World, Fishing fleet, Versace Palazzo Hotel, Marina Mirage, Fishermans Wharf, Water Police, Sea Scouts and the Southport Yacht Club. Southport is a suburb and a business district near the mid-point of the Gold Coast, Australia. 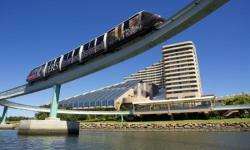 Southport is recognised as the central business district of the City of Gold Coast. Southport was the central entertainment location of the Gold Coast. 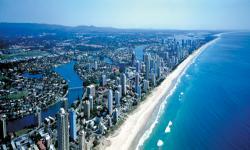 Currently Southport is set apart from the normal tourist hub of the Gold Coast. The area of coast facing Southport is known as the Broadwater. The Broadwaterway is a foreshoreway that encourages pedestrians and cyclists to travel along the Broadwater foreshores of Southport. Gold Coast Hinterland with lush rainforest, rustic cafes, spectacular views, picturesque wineries and wonderful walks, the Hinterland is the Gold Coast's best-kept secret. While nearby Surfers Paradise and Byron Bay are often swamped by tourists the Gold Coast Hinterland retains an endearing community spirit. An electric group of local artists exhibit their works, cosy restaurants and cafes hug the sidewalk and atmosphere abounds. Located 50 minutes drive from the coastal strip, the Gold Coast Hinterland contains an amazing 29 national parks and nature reserves and World Heritage-listed national parks. It is also home to Australia's largest area of subtropical rainforest, the world's biggest volcanic caldera (of which Mt Warning is the "core") and 300kms of walking trails. Thunderbird Park is an amazing wildlife and geological rich oasis over 112 hectares on Tamborine Mountain. Activities in the Gold Coast Hinterland include fossicking for your very own Thunderegg in the World's largest Thunderegg mine. 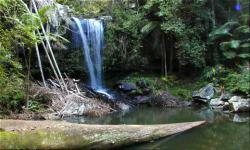 The Gold Coast Hinterland is also home to the the Springbrook National Park, Lamington National Park, and the Purlingbrook Falls. Mermaid Beach is 10 minutes south of Surfers Paradise. Still Surfer's Paradise is within easy reach and Broadbeach, with its trendy pavement café scene and multitude of shops, is an easy walk. Situated just to the south of the town centre is Mermaid Beach and with Mermaid being somewhat quieter than the bustle Surfers Paradise and Broadbeach, you could say this is the perfect family beach. Mermaid is a short drive away from the great surf points of Burleigh Heads, Palm Beach and the world famous surfing beach at Kirra. Mermaid Beach has numerous fine dining options and is just minutes from Jupiter's Casino and the huge Pacific Fair shopping complex. Golden beaches and rolling surf are right at your doorstep. If you want accommodation ranging from hotels, self service apartments to rental property packages, you'll find great accommodation options for your stay in Mermaid Beach. Palm Beach and Elanora is located south of Surfers Paradise and just north of Currumbin. 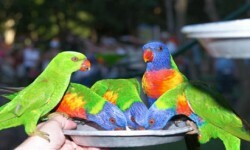 One of the major tourist attractions, the 20 hectare Currumbin Sanctuary is a National Trust park where animals roam free and visitors can admire the many native birds in the walk-through rainforest aviary. Fishing is great at Palm Beach and Elanora with surf beaches, off-shore reefs and the Tweed and Nerang rivers. Palm Beach and Elanora is located on the southern part of the Gold Coast, Australia and has been voted Queensland's cleanest beach. Take a stroll along Palm Beach to Burleigh Heads, or go fishing in the nearby still water of the Currumbin Estuary. Palm Beach and Elanora is located only 10 minutes from Coolangatta (Gold Coast) Airport. You will find shops and restaurants along the Gold Coast Highway. Palm Beach and Elanora is an ideal family holiday Gold Coast destination. Currumbin Wildlife Sanctuary and beautiful beaches are all within close proximity. Currumbin is a suburb in the Gold Coast region. The Gold Coast Highway winds over the Currumbin headland and past the Currumbin Wildlife Sanctuary. The Currumbin Wildlife Sanctuary is a long standing icon and landmark of the Gold Coast. Currumbin Alley is a popular surfing site formed on the bar of Currumbin Creek. Elephant Rock and Currumbin Rock enclose a discrete surf beach. Nearby the Currumbin In The Bin short film festival usually coincides with the Swell Sculpture festival held in the carpark opposite the Currumbin Wildlife Sanctuary. Tugun is a beachside suburb of the City of the Gold Coast. 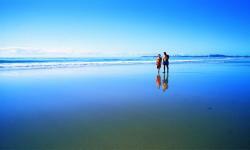 Tugun is a popular holiday destination, with a number of holiday units and motels lining Tugun Beach. Tugun is joined to its neighbouring suburbs of Currumbin and Bilinga via the Gold Coast Oceanway. Tugun is very close to the Coolangatta Airport (Gold Coast Airport). Tugun is often misspelled as Tugan. Palm Beach and Elanora are located just north of Currumbin Beach. Palm Beach and Elanora are located on the southern part of the Gold Coast, Australia and has been voted Queensland's cleanest beach. Take a stroll along Palm Beach to Burleigh Heads, or go fishing in the nearby still water of the Currumbin Estuary. 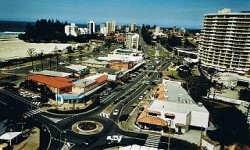 Coolangatta is the southern most suburb of the Gold Coast. 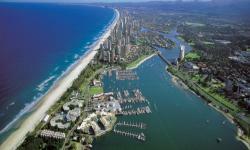 Coolangatta shares the Queensland and new South Wales border with its "Twin Town" - Tweed Heads. 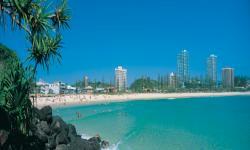 The town of Coolangatta is situated on the beach between the rock headlands of Point Danger, Greenmount and Kirra. In early land surveys in 1883, the Twin Towns of Coolangatta and Tweed Heads were laid out on each side of the border. The Gold Coast Airport (formerly known as the Coolangatta Airport) is located near Coolangatta. Coolangatta offers dive sites at Kirra and Cook Island to the south. Coolangatta has Kirra and North Kirra to the north, Rainbow Bay and Tweed Heads to the south. Coolangatta is named from the boat Coolangatta wrecked on the beach to the north of the Tweed River in 1846. Check out our Gold Coast accommodation including Gold Coast hotel accommodation, Gold Coast resort accommodation, Gold Coast apartment accommodation. We also have Gold Coast bed and breakfast accommodation. And discount Gold Coast accommodation. Simply call our Call Centre to revieve the best prices available for your time of stay. Book your Gold Coast accommodation now to avoid dissapointment!